Bike Jam is over and it was a huge success. Our amateur racers had some good rides, and the pro team notched the Vee in front of the title sponsor, the Kelly family. I was in the pro race and it was fast from the gun. 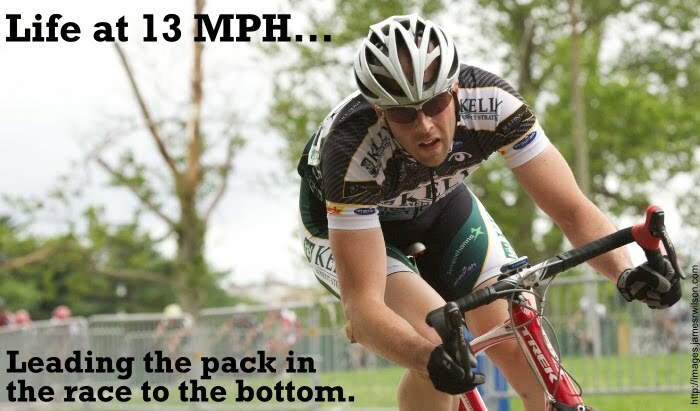 I was stuck mid pack for the majority of the race and unable/unwilling to move up as the field was strung out. In the last 1/4 of the race, the gaps started to open and I after closing a few, I cracked. End of race. Sunday was a Crit down at RFK stadium in D.C. It was on a 2 mile long pan flat course through several parking lots around the stadium. Again it was fast, but the course was so wide open it was pretty easy to move up. It came down to a bunch sprint and I was 14th. Still a little off my form, but getting better. I actually felt like I was part of the race today, which was a boost for the morale. One last note on how small the cycling world is. I ran into some old friends that I expected to see. Baumann and Bennett were both at Bike Jam, and it was nice to see some of my old racing friends. Then there were some surprises. Liz F. from Ohio state and her man Ben just got back form spending 2 years in South America and are moving to DC. They found some time to squeeze in some bike racing while out east looking for a place to live. It never ceases to amaze me at how close knit of a community the cycling world is. Fuentes from Battley Harley won (again). That dude is killing it. Two top 5's at NRC events in the past few weeks and stomping on people at the local events. It was cool to see you too! We'll be back in a few months, so we'll have to hook up to ride and you can give us beta on the scene.